Upon arrival at Istanbul’s Ataturk International Airport, you will be met by one of our guides, who will assist you during your transfer to the hotel. Orientation walks. Dinner and overnight in Istanbul. Includes: (D). Day 2: Adana – Tarsus – Seleucia – Antioch. Day 3: Antioch – Cappadocia. It was here at Antioch on the Orontes that believers were first called Christians (Acts 11:26). Visit the cave where they met in secret. Paul and Silas departed from here on the second missionary journey (Acts 15:35-36). Discover the impact of leaders such as Ignatius of Antioch and John Chrysostom. In Acts 2:9, pilgrims from Cappadocia were assembled with the thousands in Jerusalem on the Day of Pentecost when they received the initial baptism of the Holy Spirit and heard the Apostle Peter preach his powerful message. We will travel to the scenic Ihlara Valley, where early Christians carved some 3,500 cave churches from the tufa rock. The beauty and quaintness of these chapels, with numerous wall paintings and Christian symbols, is astonishing. 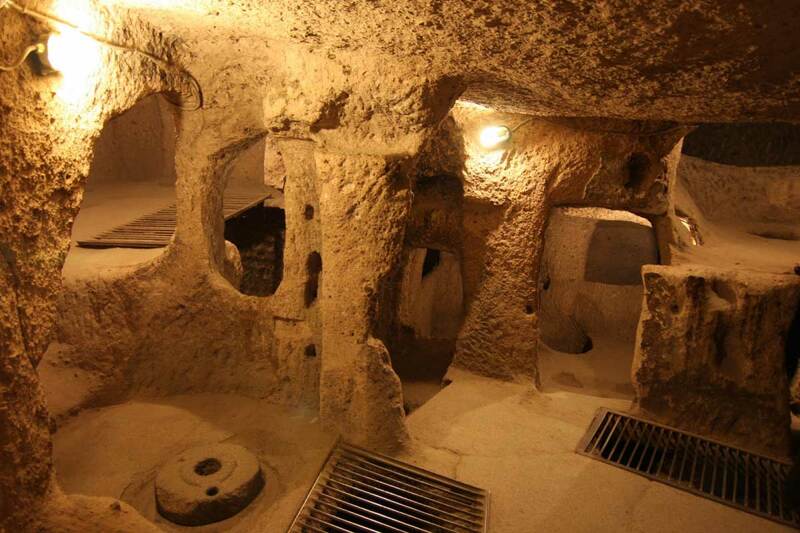 Persecuted Christians – tens of thousands of them – escaping into the earth to flee Arab invaders in the tenth century, tunnelled out more than twenty underground cities of refuge here in Cappadocia. Such cities, with carved rooms for kitchens, sleeping quarters, stables, and chapels for worship, descend five to ten stories into the earth. 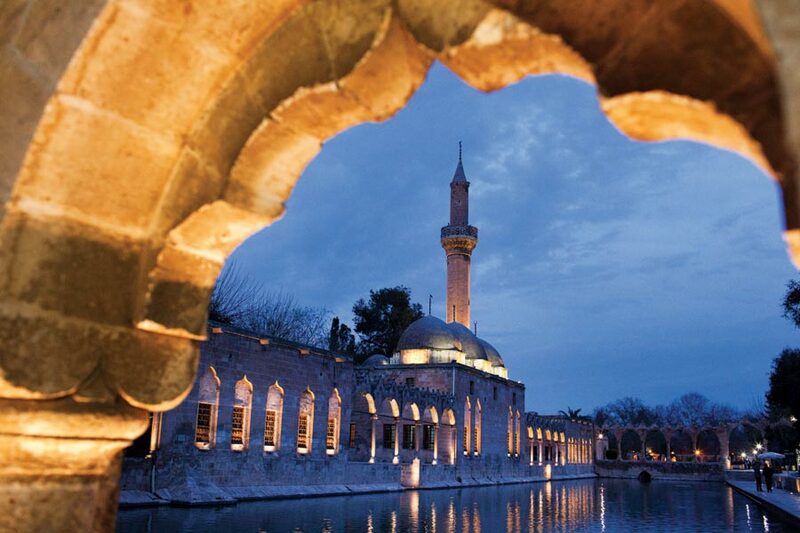 At Kaymakli, one of the best preserved of these cities, you will enjoy your own guided tour into this amazing region. Overnight in a Cappadocian cave hotel. Cappadocia, with its centre in Caesarea (Kayseri), was once the heart of the Hittite Kingdom of the Old Testament. This vast area is one of the most photogenic landscapes in the world. 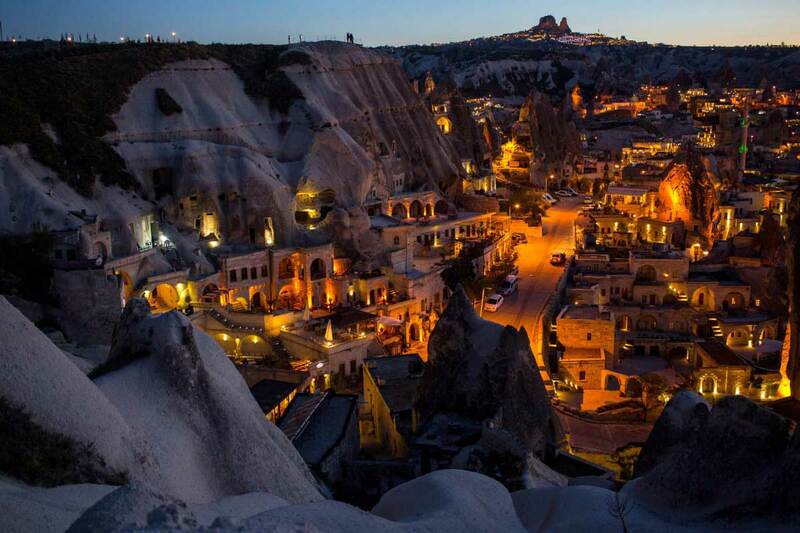 Extraordinary rock formations have become symbolic of this region, where you will enjoy the Valley of the Fairy Chimneys and Goreme’s breathtaking Open Air Museum. Watch the potters at their craft, in the famous pottery producing town of Avanos. 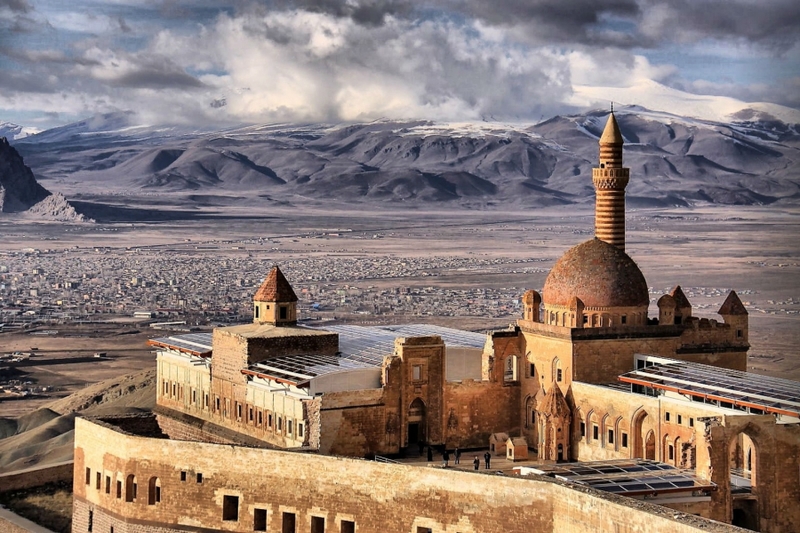 Finally, savor the natural wonders of the Citadel of Uchisar and Zelve Valley. Overnight in a Cappadocian cave hotel. Day 5: Sultanhan – Lystra – Iconium. 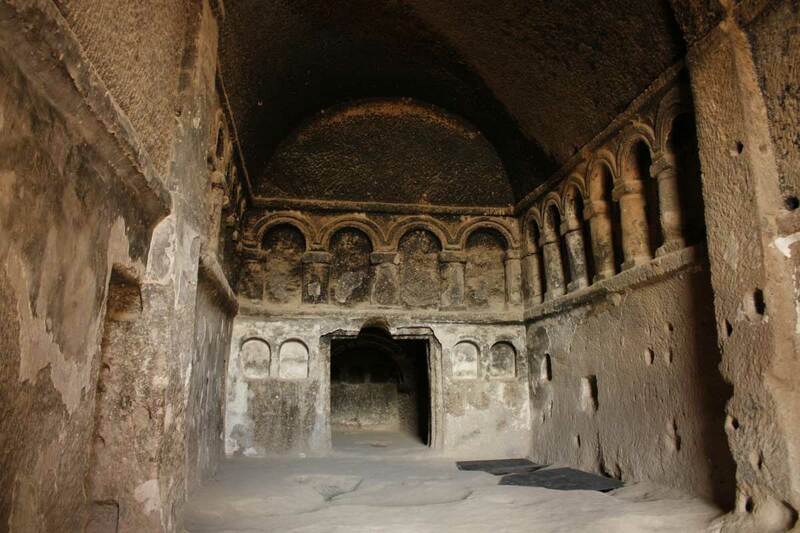 Drive to the Sultanhani Caravansary for a fascinating look at one of the rest stops for ancient camel caravans. Along the trade routes, such caravansaries appeared at intervals of some twenty-five miles, the average distance that camels could travel in a day. Continue on to Lystra, where a mob stoned Paul during his first journey (Acts 14:6-19), and where Timothy joined him during the second journey (Acts 16:1-3). Depart for Iconium (Konya), where Paul preached and encouraged believers during his first missionary journey (Acts 14:1-6). Iconium was once the home of the sect of mystical Muslims called Whirling Dervishes. Overnight in Konya. Day 6: Antioch of Pisidia – Colossae – Hierapolis. Drive to Antioch of Pisidia, where nearly the whole city came to hear Paul preach during his first missionary journey (Acts 13:14-52). The marvelous excavations include the ancient church and the great first-century Temple of Augustus. Today, you will travel the Royal Road that once connected Ephesus with distant Babylon. Visit the unexcavated site of ancient Colossae by the village of Honaz. The Apostle Paul wrote one of his prison epistles to the church at Colossae, a city situated on the Lycus River. At Hierapolis (Pamukkale), enjoy the Cotton Castles of brilliant white calcium rock formations and hot-water travertine’s, where hot mineral waters emerge from the earth and cascade over cliffs. As the water cools, the calcium precipitates and clings to the cliffs, forming snowy white travertine’s (waterfalls of white stone), which give it its name Pamukkale, meaning cotton castle . This enchanting place is one of the natural wonders of Asia Minor. The churches here in Hierapolis, Colossae, and Laodicea once flourished under the ministry of Epaphras (Colossians 4:12-13). Overnight stay in Pamukkale. Day 7: Hierapolis – Laodicea – Philadelphia – Sardis – Smyrna. Explore incredible excavations at Hierapolis, including a Byzantine church, the Great Theatre, the Temple of Apollo, and the Plutonium, which pagan cults once called the entrance to hell. Examine the intriguing sites of the Churches of Revelation. Laodicea (Rev. 3:14-22) will take you back to the first century. At Philadelphia (Rev. 3:7-12), your Bible will come alive as you read it in light of firsthand study. This city was located along the important trade route that linked Pergamum in the north with Laodicea to the south. In A.D. 17, an earthquake devastated twelve Asian cities, including Philadelphia, and for a time the people lived in fear of aftershocks. Philadelphia was rebuilt with help from Emperor Tiberius. At Sardis (Rev. 3:1-5), your thoughts will turn to the Old Testament period following the 586 B.C. destruction of Jerusalem. That was the time when the phrase rich as Croesus originated. Croesus (560-546 B.C.) was the king of Lydia, and Sardis was his capital. Gold was discovered in the Pactolus River at Sardis and it was here that coinage began, as we know it. Cyrus and the Persians defeated and captured Croesus for all his wealth and made Sardis the administrative centre for the western part of their empire. The fabled Royal Road connected Sardis with the Persian cities to the east. Sardis was the hardest hit of the twelve cities destroyed in the earthquake of A.D. 17. Emperor Tiberius, according to the Annals of the historian Tacitus, gave much relief towards its rebuilding. Your visit to Sardis will include the imperial court and the ancient Jewish synagogue. You will rest in the shade of the Temple of Artemis, while studying in the light of prophetic Scripture. Finally, enjoy dinner at one of Smyrna’s (Izmir’s) famous kebab or seafood restaurants. Overnight stay in Izmir. Day 8: Smyrna – Miletos – Didyma. Ephesus (Rev. 2:1-7), major port city on the Aegean, was the commercial, political, and religious centre of all of Asia Minor. After a lunatic completely burned the Temple of Diana (Artemis) on the night that Alexander the Great was born in 356 B.C., the Ephesians worked for 120 years to complete a magnificent reconstructed temple, one of the Seven Wonders of the ancient world. The city became part of the Roman Empire in the second century B.C. As a Roman capital of Asia Minor, Ephesus boasted a population approaching 250,000 people. The Apostle Paul’s first visit to Ephesus was brief during his second missionary tour (Acts 18:19-21). His second visit lasted about three years during his third missionary tour (Acts 19:1 to 20:31). Luke’s account of the worship of Diana appears in Acts 19:34-35. The Great Theatre (stadium) mentioned in Acts 19:29-31 could seat 25,000 people. Walk the marble-paved street with grooves made by chariot wheels. See the Fountain of Trojan, the Library of Celsus and the Great Theatre. Visit the Chapel of the Virgin Mary (Double Church), where the Third Ancient Council convened. Enjoy St. John’s Basilica (built on the site of the Apostle Johns tomb) and ponder the remains of the Temple of Diana. Finally, enjoy a visit to the Ephesus Museum. Overnight Kusadasi. Day 10: Thyatira – Pergamum. Day 11: Troy – Troas – Assos – Bursa. Enjoy a fascinating visit to recent excavations of ancient Troy, made legendary by Homer’s story of Helen and the Trojans’ wooden horse. Then drive to Troas, founded about 300 B.C. by one of the generals of Alexandria the Great. During the Apostle Paul’s second missionary journey, it was from Troas that he received the Macedonian call to Europe. This is where Luke’s account changes from they to we (Acts 16:6-12), indicating that he joined Paul’s team at Troas. Returning from Macedonia during his third journey, Paul was in Troas for a week, when the young man Eutychus fell from the third loft as Paul preached. Paul soon walked some thirty miles to Assos, where we will follow the apostles footsteps to the old city walls (Acts 20:5-14). You will walk the old marketplace of Assos and see the council chamber and Temple to Athena. Continue on to Bursa for a visit to its centuries-old silk market. Overnight in Bursa. Day 12: Nicea – Istanbul. At Nicea (Iznik), you will see remains of Constantines palace, now covered by the water at the shore of Lake Iznik. It was here in this palace chapel that the First Ancient Church Council convened in A.D. 325 to produce the Nicene Creed. Enjoy Niceas St. Sophia Church, where the Seventh Church Council convened in 787. Continue to Istanbul for lunch at the Spice Bazaar. Istanbul, the only city that spans two continents, was originally “Byzantium;” it became “Constantinople” in A.D. 330, when Emperor Constantine renamed it for himself and built a palace here. It became “Istanbul” in 1453. Experience the unique markets, peddlers, and stalls selling almonds, pistachios, iced drinks, and black coffee – a vigorous anthill of Turkish life. Relax on a Bosphorus cruise on a private boat. Finally, enjoy an orientation drive of the city. Overnight in Istanbul. Todays visits begin with Istanbul’s Hippodrome, once a stadium with 100,000 seats, where chariot races and circuses often degenerated into violence. Visit the nearby Blue Mosque. The Second Church Council (381) met in the Church of St. Irene, the first church ever built in Istanbul. You will visit the fifteenth-century Topkapi Palace of the Ottoman Sultans. In the first court of this palace stands the Church of St. Irene, the city’s cathedral church until the Church of Hagia Sophia (Holy Wisdom) was completed in 360. After rioters burned both churches to the ground in 532, Emperor Justinian rebuilt them to their present grand scale. Upon entering his newly built Hagia Sophia for the first time, Justinian exclaimed, “Glory to God that I have been judged worthy of such a work. Oh Solomon, I have outdone you!” Enjoy your visit to the Hagia Sophia, where the 5th Church Council met in 553. For a thousand years, this was the largest church in Christendom. When Mehmet the Conqueror made it a mosque in 1453, he added four minarets (prayer towers). The building has not been used as a mosque since 1935, when it became the Museum of Byzantine Art. The four minarets remain. Conclude your day with a visit to the Grand Bazaar, an ancient covered market of some 4,000 shops. Overnight in Istanbul.